The Russian Football Championship (Russian: Чемпионат России по футболу, Chempionat Rossii po Futbolu), or Russian Premier League (Российская премьер-лига), is the top division professional association football league in Russia. The competition is administered by the Russian Football Premier League [ru]. There are 16 teams in the competition. The league has three Champions League qualifying spots given to the top three teams at the end of the season and the two Europa League spots will be allocated to the fourth and fifth placed teams. The last two teams are relegated to the Russian National Football League at the end of the season. The Russian Premier League was established in 2001 and rebranded in 2018. The Russian Premier League succeeded the Top Division including history and records. The Top Division was run by the Professional Football League of Russia. Creation of the Premier League is considered to give the clubs a greater degree of independence. The league is currently called Rosgosstrakh Russian Football Championship for sponsorship reasons. Lokomotiv Moscow is the Russian Premier League champion. After the dissolution of the Soviet Union, starting in 1992, each former Soviet republic organized an independent national championship. In Russia, the six Russian teams who had played in the Soviet Top League in 1991 (CSKA Moscow, Spartak Moscow, Torpedo Moscow, Dynamo Moscow, Spartak Vladikavkaz, and Lokomotiv Moscow) were supplemented with 14 teams from lower divisions to form a 20-team Russian Top Division. The Top Division was further divided into two groups to reduce the total number of matches. The number of teams in the Top Division was gradually reduced to 18 in 1993 and 16 in 1994. Since then, the Russian Top Division (and subsequently the Premier League) has consisted of 16 teams, except for a short-lived experiment with having two more teams in 1996 and 1997. Spartak Moscow was the dominant force in the top division, winning nine of the first ten titles. Spartak-Alania Vladikavkaz was the only team which managed to break Spartak's dominance, winning the top division title in 1995. Lokomotiv Moscow have won the title three times, and CSKA Moscow six times. 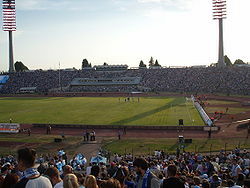 In 2007, Zenit St. Petersburg climbed to the top, winning the title for the first time in their history in Russian professional football; they had also won a Soviet title in 1984. 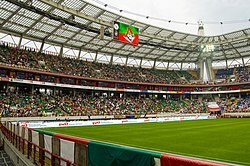 2008 brought the rise of Rubin Kazan, a club entirely new to the Russian top flight, as it had never competed in the Soviet Top League. In mid-2010s, some stadiums opened. CSKA Moscow got a new stadium named Arena CSKA, later named VEB Arena. It holds a capacity of 30,000. FC Krasnodar got the most modern stadium in Europe named Krasnodar Stadium. It holds a capacity of 34,000. In preparation for the 2018–19 season, it was decided to hold a rebranding in which a new logo was presented, and the league was renamed the Russian Premier League (RPL). Teams in the Russian Premier League play each other twice, once at home and once away, for a total of 30 matches. Three points are awarded for a win, one for a draw, and none for a loss. If teams are level on points, the tie-breakers are the number of wins, then the goal difference, followed by several other factors. If the teams are tied for the first position, the tie-breakers are the number of wins, then head-to-head results. If the teams tied for the first place cannot be separated by these tie-breakers, a championship play-off is ordered. As of 2010, the champions and the runners-up qualify for the UEFA Champions League group stage. The third-placed team qualifies for the Champions League Third qualifying round. The fourth- and fifth-place teams qualify for the UEFA Europa League. The bottom two teams are relegated to the First Division (renamed the National Football League starting in 2011). Unlike most other European football leagues, the league traditionally ran in summer, from March to November, to avoid playing games in the cold and snowy weather in winter. This was altered ahead of the 2012–13 season, with the league planning to run the season from autumn to spring. The transitional season of the competition began in early 2011 and continued until summer of 2012. After the 16 Premier League teams played each other twice over the course of the 2011 calendar year, they were split into two groups of eight, and the teams played other teams in their groups two more times for a total of 44 games (30 in 2011 and 14 in 2012). Those two groups were contested in spring 2012, with the top eight clubs playing for the title and European places. The other sides vied to avoid relegation: the bottom two went down while the next two played off against the sides third and fourth in the National Football League, with the two losers being relegated (or denied promotion). Under the current autumn-spring calendar, the league takes a three-month winter break from mid-December until mid-March. The Youth championship (Russian: Молодежное первенство), also known as Youth teams championship (Russian: Первенство молодёжных команд), Reserve team tournament (Russian: Турнир дублирующих составов) or Reserves tournament (Russian: Турнир дублёров), full name Youth football championship of Russia among teams of clubs of the Premier League (Russian: Молодёжное Первенство России по футболу среди команд клубов Премьер-Лиги), is a league that runs in parallel to the Russian Premier League and includes the youth or reserve teams of the Russian Premier League teams. The number of players a team can have on the pitch at a time that are over 21 years of age or without a Russian citizenship is limited. 16 teams participate in the league. Matches are commonly played a day before the match of the senior teams of the respective teams. All of the Russian Premier League teams are obliged to have a youth team that would participate in the Youth championship. The teams that are promoted from the National Football League and do not have a youth team must create one. The teams in the league are not relegated based on their final league position, but on the league position of their respective clubs' senior teams. It has to be noted however that some Premier League clubs have three teams. Apart from the senior team and the team that plays in the Youth championship a team might have another senior team that plays in a lower division of Russian football and serves as the farm team for the main team. Some examples include Spartak-2 and Zenit-2, playing in the Russian Football National League. As of the end of the 2017–18 season. Teams in bold compete in 2018-19 Premier League. For clubs that have been renamed, their name at the time of their most recent season in the Russian League is given. The current members are listed in bold. Includes championship play-offs, does not include relegation play-offs. For the purposes of this table, each win is worth 3 points. The three-point system was adopted in 1995. Terek were deducted 6 points in 2005. KAMAZ-Chally were deducted 6 points in 1997. ^ "Новый логотип премьер-лиги. Просто бомба!". 12 April 2018. Retrieved 12 September 2018. ^ "Медведь на логотипе РФПЛ". Retrieved 12 September 2018. ^ "Представлен рабочий вариант нового логотипа РФПЛ". Retrieved 12 September 2018. ^ "Cоздание логотипа Российской премьер-лиги". www.artlebedev.ru. Retrieved 12 September 2018. ^ "Russian league switches to new calendar". UEFA.com. UEFA. 13 September 2010. Retrieved 13 September 2010. ^ "Arena CSKA (VEB Arena)". ^ Sansun, David (2 March 2019). "RPL announce live matches to be broadcast free on YouTube". Russian Football News. Retrieved 17 March 2019. Wikimedia Commons has media related to Russian Premier League.